Those of you who are familiar with my designs and my tastes will have probably realised that I adore autumn colours as they suit my colouring being a red head. (although not as red as it used to be. LOL!). So even though I cannot wear pinks and blues, and would naturally design and embroider in my favourite colours, I always try to design embroidery in lots of different colour schemes! The colours I select for each collection are very carefully chosen as I believe the colour is as important as the quality of the digitising. I changed the colours to Sulky Rayon gold (1070) which is one of my favourite colours! I also used cream (1022) and an off white (1071) along with the original greens which are Sulky Rayon 1211 – light Khaki & Sulky Rayon 1508 – Putty. 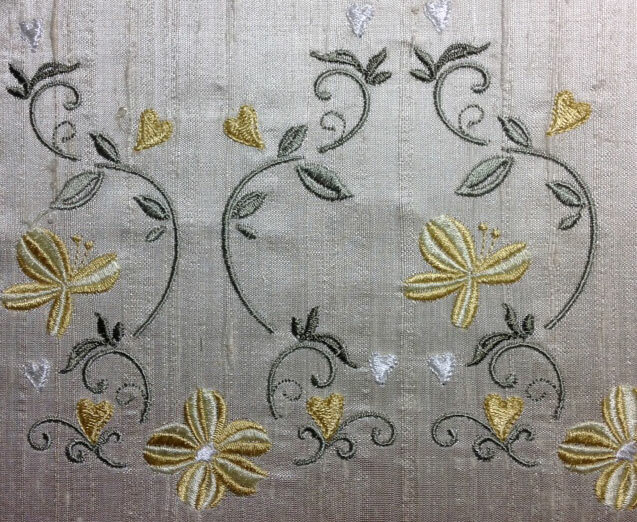 Look how different they look stitched on slubby cream silk dupion! They really come alive and glow don’t you think? This particular design can be used to create an endless horizontal border and comes from the third set in the collection, due to be released on 26th January 2015. Please experiment with colour not forgetting that the fabric you embroider on will also effect the colours especially if you are using a dark fabric. You will find it very helpful to take your threads outside to see how they look in natural light. How do you go about choosing a whole new colour scheme for an embroidery? Well I take photos when I am out and about shopping. If a particular scheme catches my eye I capture it with my iPhone so I don’t forget it. This can be very helpful and it won’t just be the clothes department where you will be inspired. Some unusual places I found lovely combinations are on wrapping and wall paper, in art or in a display of plants at my garden centre! If necessary invest in some new thread colours as you can never have enough to choose from, and lastly be careful not to add too many colours. Instead go for shades and tones as they blend easily and look more natural! 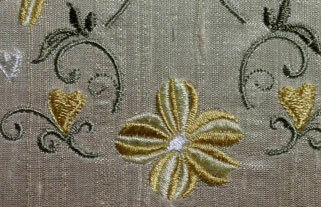 This entry was posted in Discussing machine embroidery and tagged machine embroidery, The importance of colour. Bookmark the permalink. 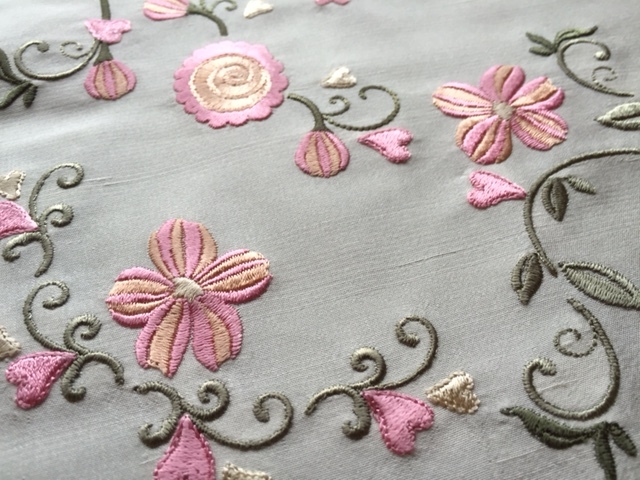 Hazel I was wondering do you use a fusible interfacing when your embroidering on the silk dupioni? Your fabric looks so smooth and wrinkle free? Not usually unless it is for something very special. I hoop stitch and tear and apply the silk with temporary adhesive spray, basting around the inside of the hoop to hold it in place. Before I was an embroidery digitiser I was a bridal dressmaker specialising in silk corsets and bodices so I have lots of remnants but adore silk. It is so easy to work with the weave of the fabric makes is easy to align in the hoop. The only draw back is that it cannot be washed. Do try it and you will not be disappointed. I was wondering the same thing Hazel. I am keen to start a quilt using silk dupioni and embroidery. The colors did come alive! I take pictures with my phone when I’m out and find a color combination that I love. Where would we be without our phones? 🙂 I love both color combinations you chose but the last was magic. Hi hazel, every time I visit your blog you always amuse me with such awesome and unique creative color matching and design ideas. Just don’t stop and keep sharing your designs.